I was SO excited to design a girls nursery for our second child. I knew that I wanted it to be VERY girly and beautiful. I dreamed up all kinds of ideas and my hubby worked really hard on completing my project list! I love how the room turned out and I enjoy sitting in there with my baby girl and rocking her. I must say that her room is my favorite room in the house! The vintage style iron crib was the design inspiration. 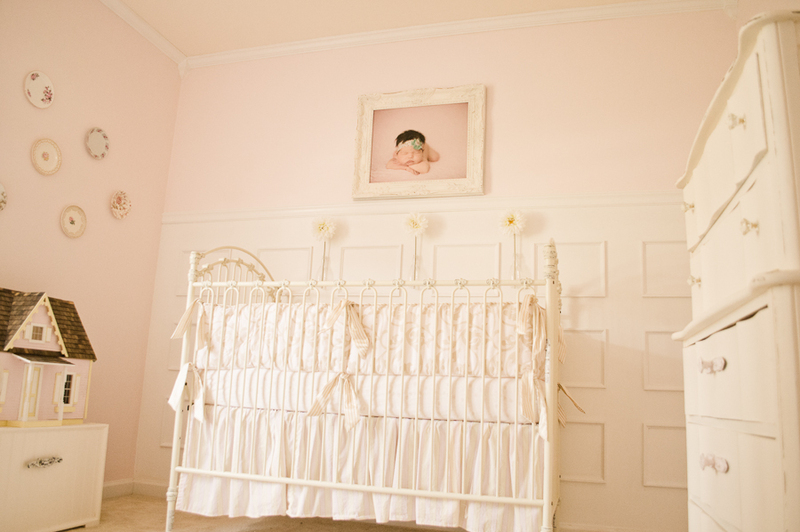 I knew with a crib like that, I would go with a vintage theme but I still wanted it to be girly and not look too 'old.' I think her room is a good balance of vintage and femenine. My decorating style is much different from the style of the nursery. Usually my style is very casual. I like the house to look pretty but still be comfortable so I try to incorporate that into my designs. More of a casual/chic or sophisticated/casual I suppose! Ava Kate's room is much more vintage, sophisticated and 'prissy' than I would normally do and I don't really do a lot of vintage looks in the rest of my home so that element sort of took me a while to get used to. I actually was pretty uneasy about it at first. But, I must say, it has really grown on me and I love it! Dresser: Vintage piece that was mine as a kid. My mom purchased it at an antique shop. I re-painted it to match the crib. I love painted wood furniture! Tiffany style lamp: Was mine as a kid. So glad I saved it all these years! Paneled wall was done by my talented hubby. I told him the design I had in mind and he created it with trim pieces and paint. It turned out GREAT! The ceiling was popcorn and my hubby scraped it off by wetting it with warm water and scraping with a metal spatula. Be sure to lay drop cloths if you attempt this project! It's really easy to get it down and so worth it. Then he re-surfaced it with texture paint and a trowel using the slap trowel method. It turned out beautiful. We used a beige colored paint so that the crown moulding would stand out more and to give the ceiling more interest. We streamlined the crown moulding installation by using the corner pieces to avoid miter cuts. Added a bit to the cost but saved lots of time and possibly waste! Her beautiful iron crib. I love it. It's the centerpiece of the room! Pick an inspiration piece and choose your design elements to coordinate with it instead of just adding ramdom things and hoping it will come together. If you aren't happy with how things look, don't be afraid to return something and wait for the 'perfect' thing to come along instead of settling for something you aren't happy with. I originally had different bedding for this room that would have given it a much different look and I am SO happy that I went with my gut and got something different, I love the bedding I ended up with!! 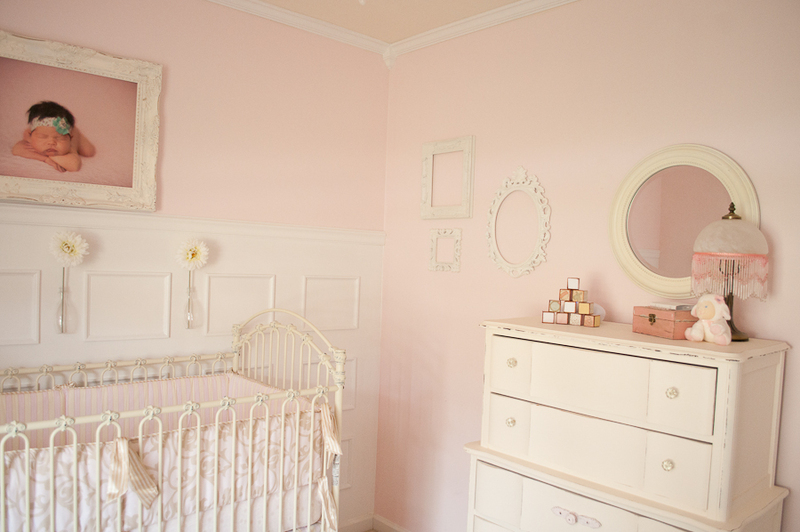 Her nursery is beautiful! 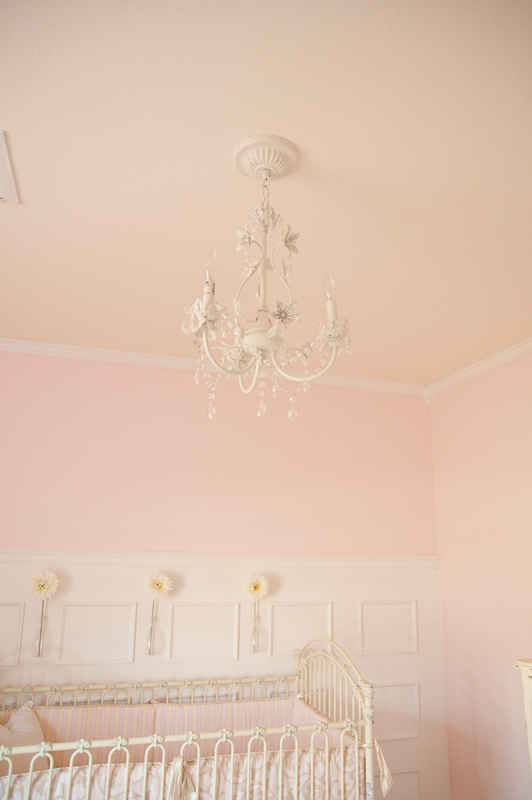 I used pink air in my little girl’s room also….but used a little darker pink for the other stripe. I did stripes. Her room looks so soft and dreamy. Love the vintage feel that the room has. Thank you so much! I loooove stripes, we have them in another room of the house and I think they look great! Gorgeous nursery. It looks really clean and soothing, and feminine and delicate with the colors you used. where did you get those plates and white frames on the wall? Thank you :) The plates are from various antique shops and thrift stores. The white frames are from Hobby Lobby! Would you mind telling me which rocker and color from walmart? I have been looking and I am afraid to order one since their are so many to choose from! It’s a beautiful room. Soooo beautiful! So serene and light. I can see why it is your favorite room in the house! Thank you :) I don’t remember the name of the rocker and recently when I tried to look it up on their website, I was unable to find it. I am wondering if it’s discontinued? So sorry, I’m sure that isn’t much help… I should mention that I bought it over 3 years ago for my first baby so it wasn’t a recent purchase! What a beautiful nursery! I love that doll house! Can you please let me know where you got the rug? It is exactly what we have been looking for and have been unable to find. Thank you! I'm a stay at home mommy of two beautiful children! I've been married to my best friend for 7 years and I love my life :) My hobbies include photograhpy and decorating our home.